This vehicle show the guide on how to retrofit DEC switch retrofit for normal/sport/sprot+ modes.And I take BMW 520 F10 as example to enable not-sport to sport control. 1.Pry out rear seat ventilation cover, pull top 1st. 2.Pry out phone compartment lock cover. 3.Remove the revealed torx screw. 4.Pry out the middle console, starting from the rear and lift towards the front. 5.At this point you can decide to disconnect all connectors for easier installation/replacement of your DEC switch. If you do, the idrive controller connector is a clip-in, press the tab on the side to release. The 2 DEC switch connectors have a notch that fits into a tiny hole on the connector socket surface. I used a mini screwdriver to ‘lift’ the side of the socket and the connectors came out easily. 6.Remove the 2 torx screws that hold the current control module and remove it. 7.Remove the revealed screw that holds the phone compartment on its front side and lift the compartment towards the front. The ICM module to which you need to connect the 2 wires, lays below. 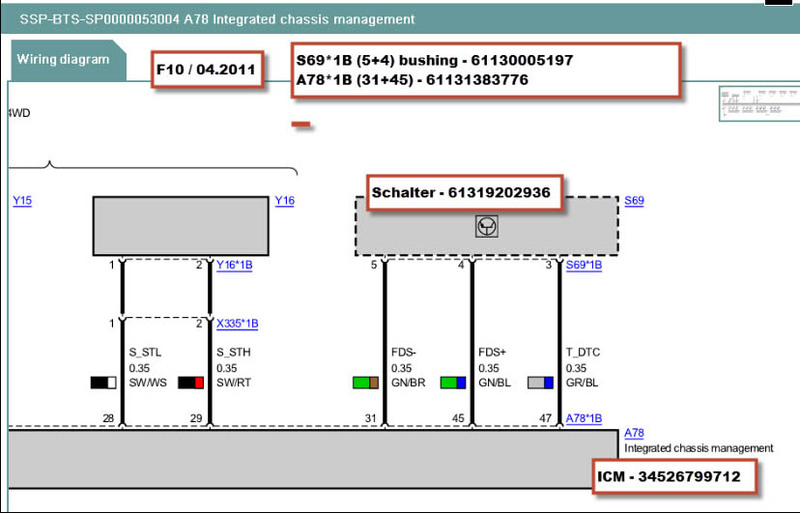 8.This last step of dis-assembly was accessing & releasing the ICM connector. The initial problem is that even when you release the connector lever, there are 2 plastic extensions/flanges from the side & in front of the connector that block it’s complete removal. So after fiddling around in acrobatic finger movements in there without success – I can tell you that the easiest way to release it is to open the 2 central console rear screws which were revealed when you removed the rear seat ventilation cover in step 1. Once these screws are removed, it’s possible to lift the rear of the console about half an inch which will be just enough to release the ICM connector as the blocking flanges are now higher…if you work alone, use a small piece of wood under it to hold it in place for assembly. Now that we have everything exposed and easily accessible, need to do the following. 1.Prepare the wires. The supplied 61130005197 wire with contact is long enough for the connections. Use a crimping tool to connect a 61131383776 contact to the bare end of the two wires. 2.On the ICM connector side, remove the connector cover. The connector is made of 2 parts that slide into each-other. a double & a single row. Identify the empty slots for pins 31 & 45 and slide your new wires in. Make sure they are fully inserted. 3.Channel the wires inside the center console towards the front and through to the same place where the DEC switch connectors appear. 4.Slide the new wires to the DEC switch connector slots 4 & 5, making sure ICM 31 goes to DEC 5, and ICM 45 to DEC 4 (see attached ISTA wiring diagram). Assembly is a reverse of dis-assembly. The center console clips are very rigid and require quite a force to ‘click’ back in. Next step is to activate the switch via coding. Based on the various forum posts & my own experience, I suggest a full VO CODE of the car. after removing 205 & adding 2TB to the options list. This took care of adding the SPORT settings menu to the CIC, added the Kombi graphics and made the proper settings for ICM & EGS now shows S1-S7 when shifted left. Note if you do that, other personal coding will need to be recoded. Some I have include activation of BMW Online menu, the digital speed display, memory off for the A/C etc. Edit: After VO coding of the modules, need to FDL code the SZL Lenkrad_Schaltpaddles -> nicht aktiv. Otherwise a fault error for the missing shift paddles will be registered in the module fault memory. 2.I’m yet to understand what exactly is the programming difference between this mod and an original 2TB purchase. Is there a way to actually identify this difference? 3.I have no ECO PRO functionality and while I tried to add 4U2 to the VO, It seems my KOMBI does not have the firmware to handle it, and I have a discrepancy in display wording. CIC shows COMFORT/SPORT/SPORT+ while KOMBI shows NORMAL/SPORT/SPORT+. The animation is also missing and coding the car with a later ZeitKriterium left me with the heater showing the residual heat logo all the time. So I dropped it for now and maybe if I figure out how to upgrade the I-Level, it will be an option..